What are your expectations when picking up a mystery to read? Are they different from when selecting a series title? 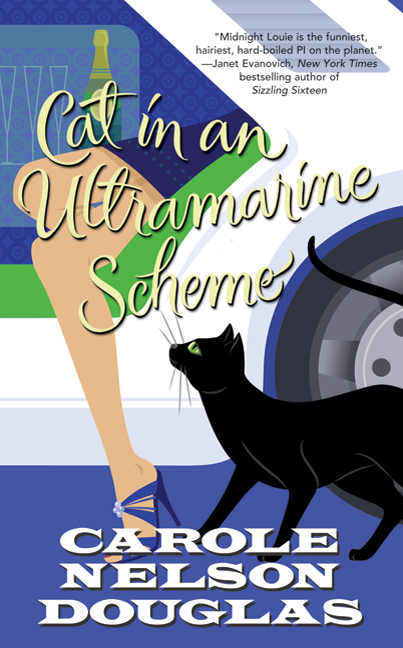 Cat in an Ultramarine Scheme, published in 2010, is the 22nd book in the series, and the first I’ve read. Because it’s a series, I don’t expect the murder to occur immediately. I’m willing to wait. After all, recurring characters and their subplots, if any, should be given a chance to breathe. Faithful readers want to catch up with their favorites while anticipating the mystery to come. Unfortunately, nothing mysterious comes until Chapter Eight, some 60 pages into the story! Prior to this, we have three narratives. Publicist Temple Barr, the series heroine, is becoming involved in an endeavor of her boss to create a mob museum/casino as an homage to Las Vegas’ past. Then there are chapters detailing Max Kinsella’s adventures to uncover his past in Ireland. Max is an amnesiac former/current lover of Temple’s. Finally, there’s Midnight Louie, a street wise cat, as he prowls around Las Vegas on the trail of adventure. His chapters are narrated by him in the first-person. Now, I don’t like talking animals in what is otherwise a generally realistic portrayal of contemporary (or historical) life. In fantasy novels, this would not be an issue. In a mystery novel, it’s harder to swallow. Fortunately, getting past this fantasy element wasn’t too hard here. Getting back to the mystery at hand, though. At first, the discovery of leg bones encased in concrete—found at the edge of a receded Lake Mead—suggested a retrospective murder tied to the Las Vegas mobster scene of the 1940s. The casino Temple works for, the Crystal Phoenix Casino, boasts its own ghost of a two-bit gangster, Jersey Joe Jackson. Jersey Joe had “stashes of mint silver dollars worth millions,” one of which had been found. Later, in Chapter Fifteen, a vault is discovered in the chunnel, wherein the mob museum is to be built. With great fanfare the vault is open and a dead body discovered. Again, I was still thinking along the lines of retrospective murder. Only the corpse is very recent, having been killed the night before. The victim, as a character, is introduced when his corpse is found. How can this be? Genre rules generally dictate introducing the murderer early, but should this not hold true for the victim as well? It’s fine for the victim to turn up dead in the first couple chapters without any prior introduction, but to appear so late (in Chapter Eighteen) without any prior introduction, mention, or build up just seems wrong. The victim, a magician, appears to be connected to the Synth, a cabal of Vegas magicians, who may or may not be connected to a series of unsolved murders. Apparently, the Synth and the sequential killings are elements that have been previously introduced in the course of Douglas’ series. Not having read previous books, though, made their inclusion here jarring. Ultimately, the mystery plot in Cat in an Ultramarine Scheme is weak. The killer ” ‘could have been looking for Jersey Joe’s treasure, now that he was in the vicinity.’ That just lay there, as linguistically lame as it was a motive for murder.” Which is unfortunate as the characters (Temple, Louie, Max, et al) hold some interest. I particularly liked one of Temple’s insights, an interesting truth about today’s media: “Newspapers were sinking like the real London Bridge in the Arizona desert. Web sites weren’t taking up the slack.” Also, I found Max’s storyline in Ireland compelling, although it doesn’t tie into Temple’s and Louie’s by the end of the novel as well as it should. I suspect the novel isn’t the strongest entry in the series, but alas, not having read others, it’s difficult to say for certain. I think it advisable to read the Midnight Louie Mystery series in the proper order, and I’m not deterred to do so. A note about the text: I read the ebook version of Cat in an Ultramarine Scheme which includes the diagrams which are part of the story, but did not distinguish the narration by use of a different font as seen in the print versions (at least the hardcover edition). Midnight Louis first-person narrations appear in a font different from the rest of the text, making it less jarring when the point of view shifts.